Do you get frustrated about the price for Oki B440-dn toner cartridges at the moment? Fortunately, at Cartridge Save you'll pay a smaller amount to get toner than any other store. Not only are we very competitive on the price of Oki B440dn toners, we also place a great emphasis on cartridge quality. We think that you should never have to compromise on print quality to buy a reasonably priced Oki B440dn printer cartridge. Consequently, we offer you a full guarantee so there isn't any reason to feel disappointed. We'll offer you a full refund in the unlikely event that your Oki B440dn cartridge isn't able to meet your expectations. Get your order in now from Cartridge Save and save money. An office printer needs to offer a few key features and thankfully, there is much to be said for the Oki B440dn. Of course, there are plenty of leading brands in this industry and you might not be entirely aware of the finer aspects of the Oki brand, but if you are seeking out a very reliable office printer, you cannot go far wrong with an Oki B440dn. There are plenty of places to start, so why not begin with the design aspect of the Oki B440dn? If you are looking for a printer which promises a great deal and manages to deliver, then the Oki B440dn is certainly worthy of investigation. However, we are yet to come across an office printer which is, in truth, overly attractive. Thankfully, this doesn't really matter any and as far as a technical design aspect is concerned, the Oki B440dn is very well put together and an easy to operate interface is included on this fine printers casing. The Oki B440dn offers plenty of perks, including speed. In many ways, speed and reliability are exactly what you require from an office printer and the Oki B440dn boasts both these aspects. What's more, the Oki B440dn is something of a workhorse, ensuring that even the busiest of offices could benefit from the addition of an Oki B440dn. We always struggle in this department as some printers really don't have a great deal of negative aspects. 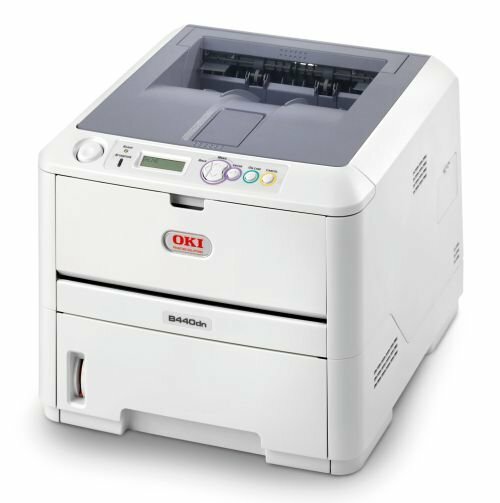 The Oki B440dn is one of these printers. As such, even if you are seeking a basic office printer, you could do far worse than consider forking out the cash for an Oki B440dn as it really does do everything you might wish an office printer to provide.